Would you like to build your own Blade System on a shoestring? Slam the door! 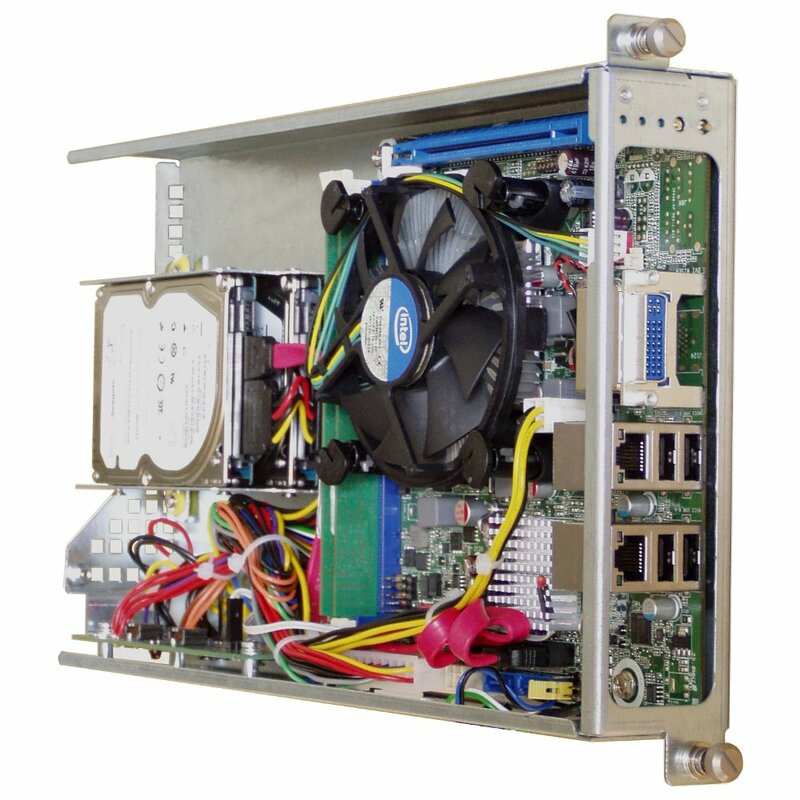 The DC91 chassis is created to make it easy. 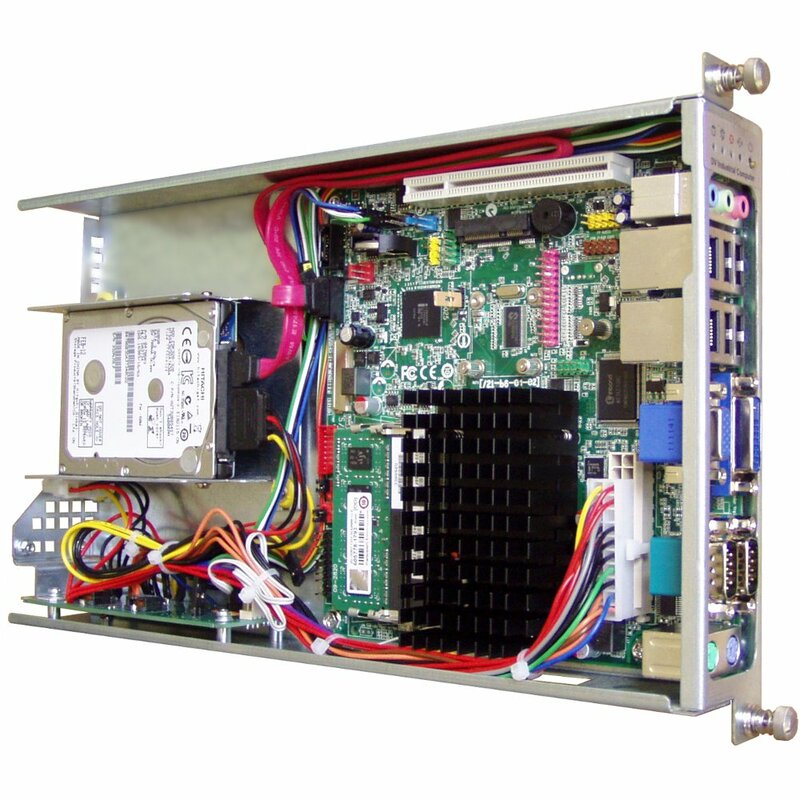 Excellent alternative to traditional 1U rackmount servers. 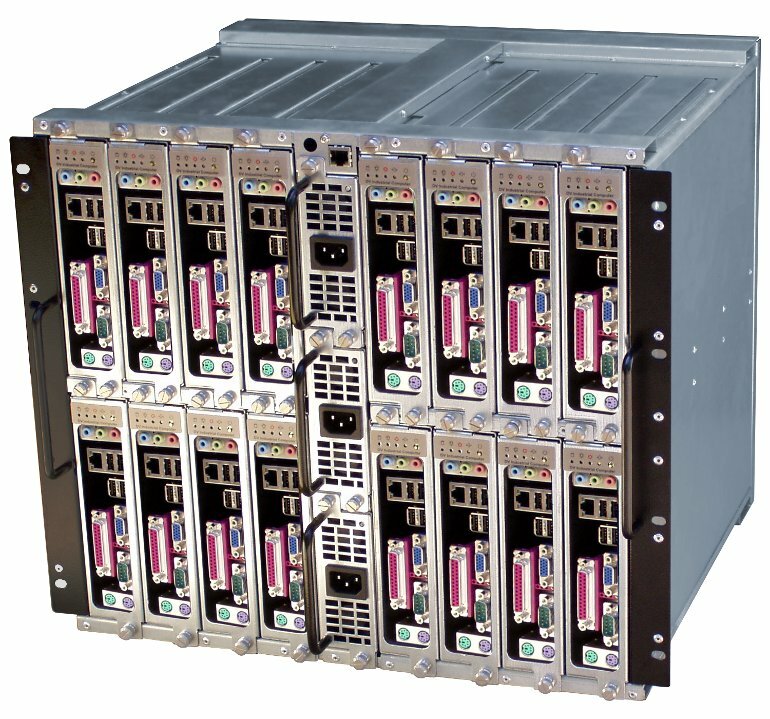 The DC91 chassis consists of Subrack (9U height), 16 plug-in Trays and 3 hot swappable redundant PSUs (2+1). The DC91 is intelligent system with remote control via Ethernet. 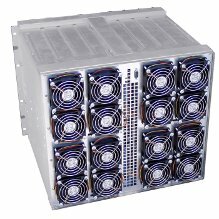 With all this going on, the price of the DC91 is not higher than that of 16 equivalent chassis of 1U! 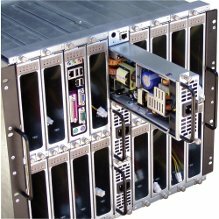 Do you want to control the blade-server from another computer or even mobile phone as if you were physically in front of it? You are welcome! 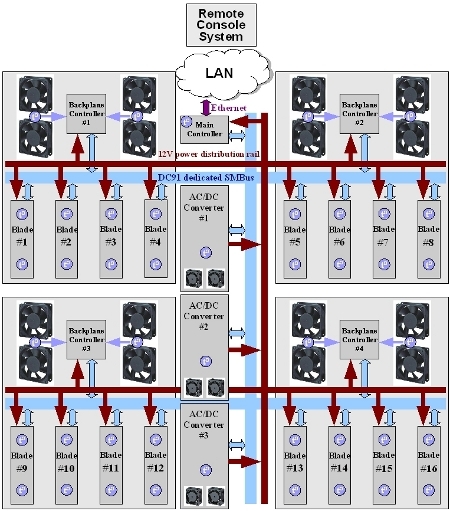 The DC91 allows to have all 16 blade computers on your fingertips across the TC/IP Universe. The DC91 can reboot, or power ON or OFF, any of 16 blade computers. Of course, you can supervise the balde server by dedicated software and automatically reboot upon failure. 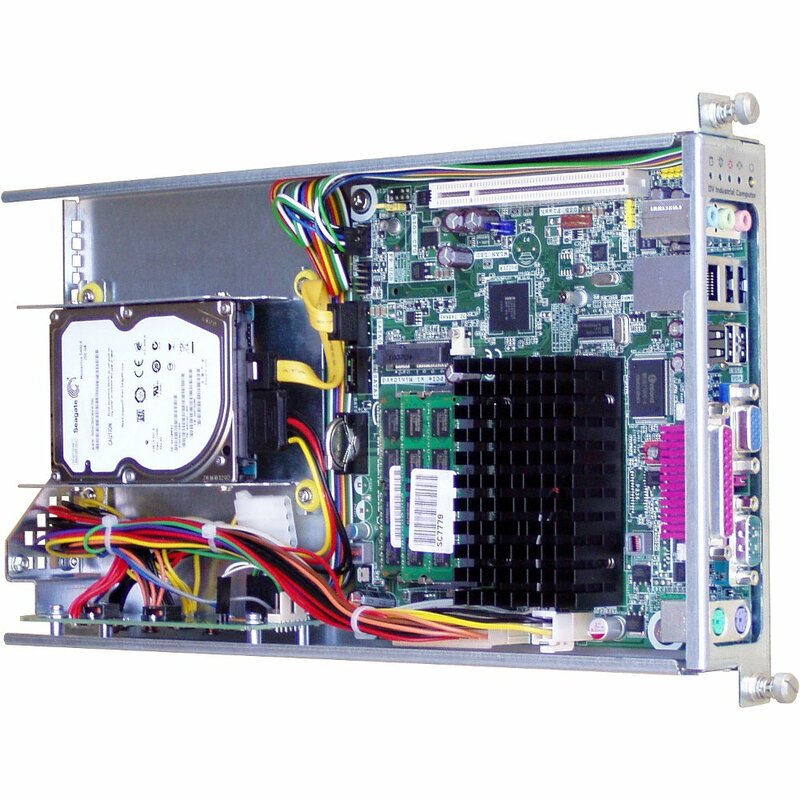 The DC91 power distribution monitor capabilities allow system administrator to monitor the power consumption of the blade computers and cooling system in real time through Internet providing various important power control functions including remote power consumption monitoring, and remote power status report. 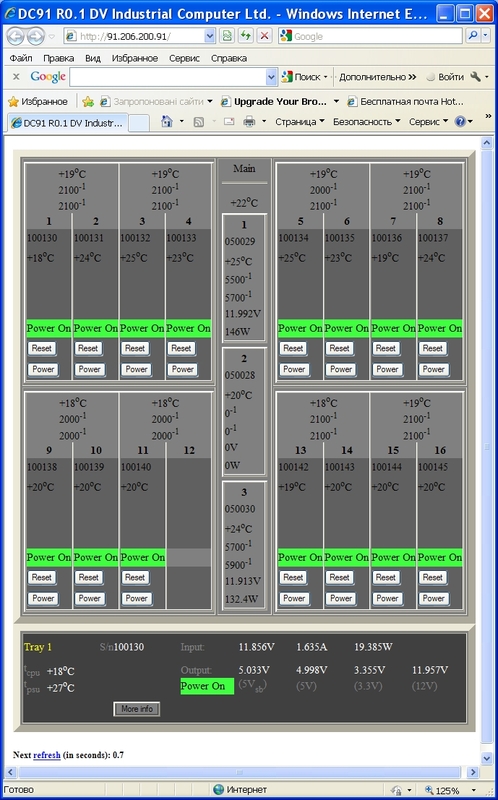 You can easily control or monitor the DC91 cooling system from your computer, tablet or smartphone from anywhere in the world. The subjects of monitoring include current fan RPM value, voltage value applied to the fan for all 22 coling fans and temperature in 44 points. 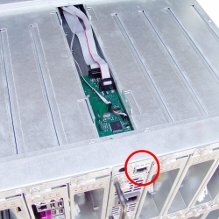 10/100Base-T Ethernet (red circle marked) allows you to plug the DC91 into any LAN that uses RJ45 connectors. 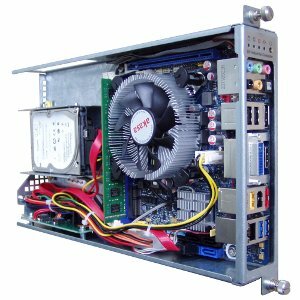 That provides the Main Controller - ARM based bare-metal system which realises HTTP/FTP servers for user friendly monitoring and management of all the DC91 components - Backplates, AC/DC PSUs as well as trays with blade servers. 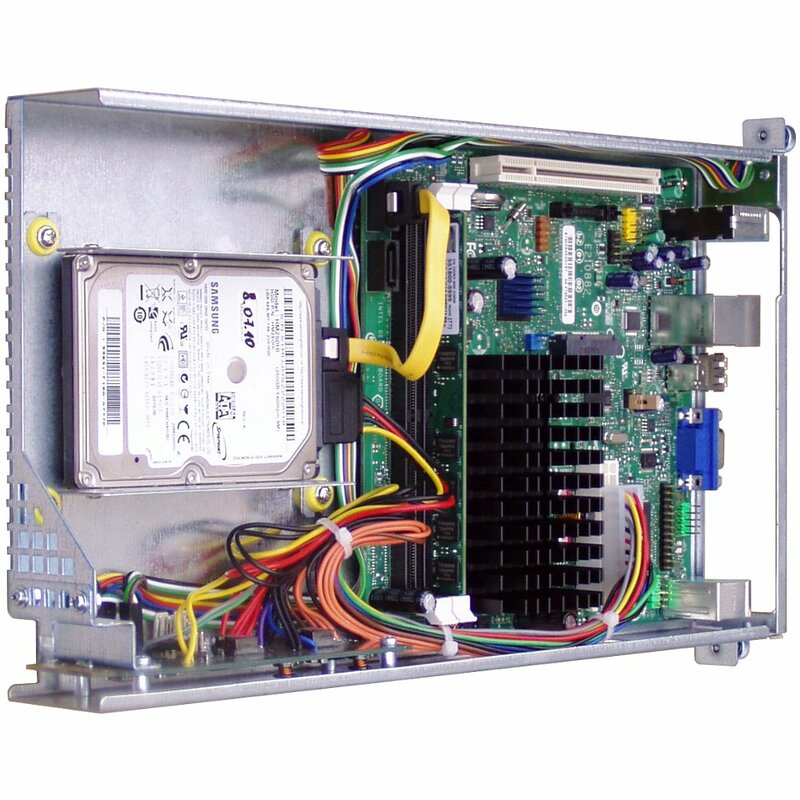 The Main Controller uses dedicated SMBus to get access to the DC91 componets and does not use any interface of motherboard to get information form blade servers. 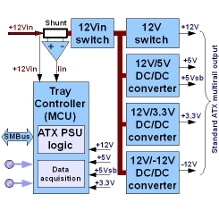 Such approach allows to create a stand-alone software/hardware independent monitoring of the blades and the rest of the DC91 componets including all voltages (even ATX rails: 5Vsb, 5V, 3.3V and 12V), fan's voltage and currents in multiple points of the main 12V power distribution rail. 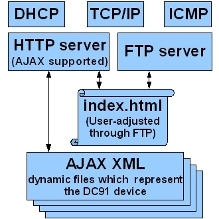 The HTTP (web) server serves out screen that is preprogrammed in the index.html file. The index.html file could be reprogrammed by user through the FTP. Acting this way user can create absolutely another GUI and even embed new services in Java script that has been run on Remote Console System. Such flexibility allows to develop author's remote control using manufacture's index.html file as a "knowlege base" to recognize "how it works" and create absolutely new user's own index.html file. The DC91 Tray is the basement for the blade server. 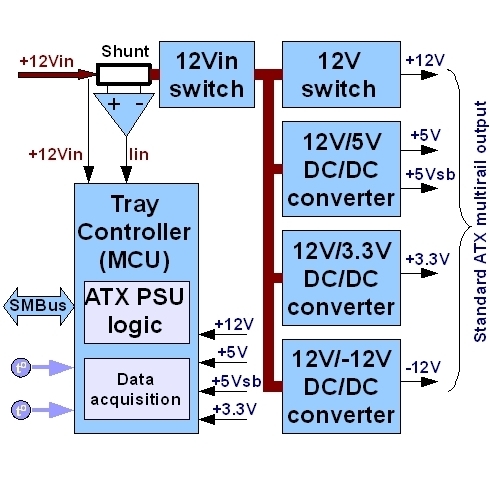 The DC91 Tray contains control board with MCU and DC/DC ATX converter. The MCU controls various functions of the power supply operation. Also, it realizes current, voltage and temperature monitoring. 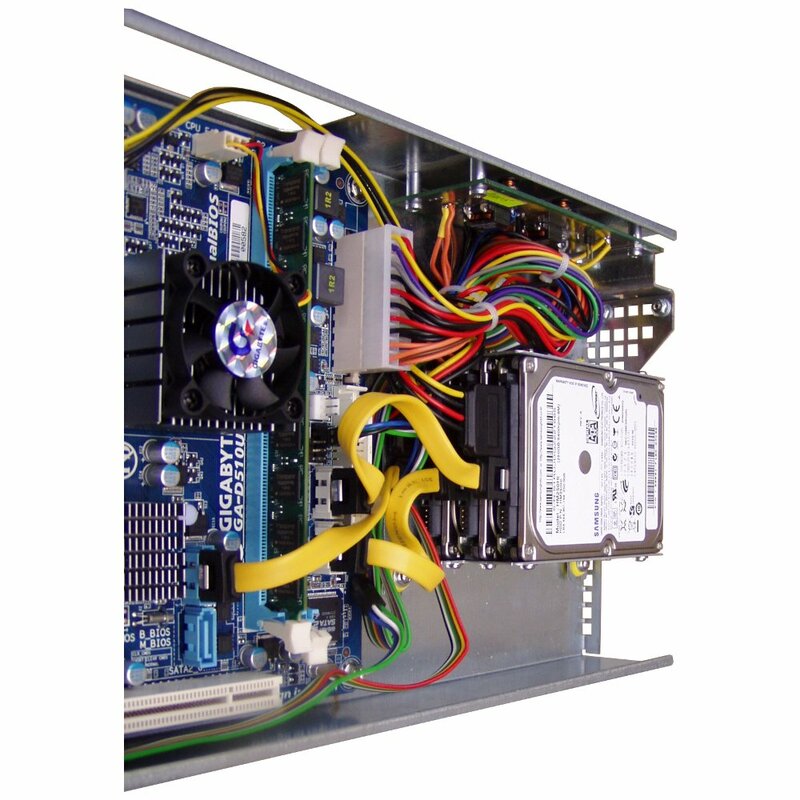 The DC/DC ATX converter is specially designed to supply a low power consumption Mini-ITX system from a single 12V power source. The tray board uses only ceramic capacitors. So, it can be used for long time operation at 50ºC and higher without fundamental loss of reliability. If 3.5''HDD should be used the HDD cage is replaced. You can use either one standard 1" height HDD or two slim 2/3" height HDDs. 2x3.5HDD cage is supplied as option, but it is advisable to order required cage together with chassis. 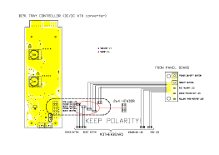 Please refer to the following schematic to get tray connection to the motherboard right . NOTE! The polarity of connection is very important. 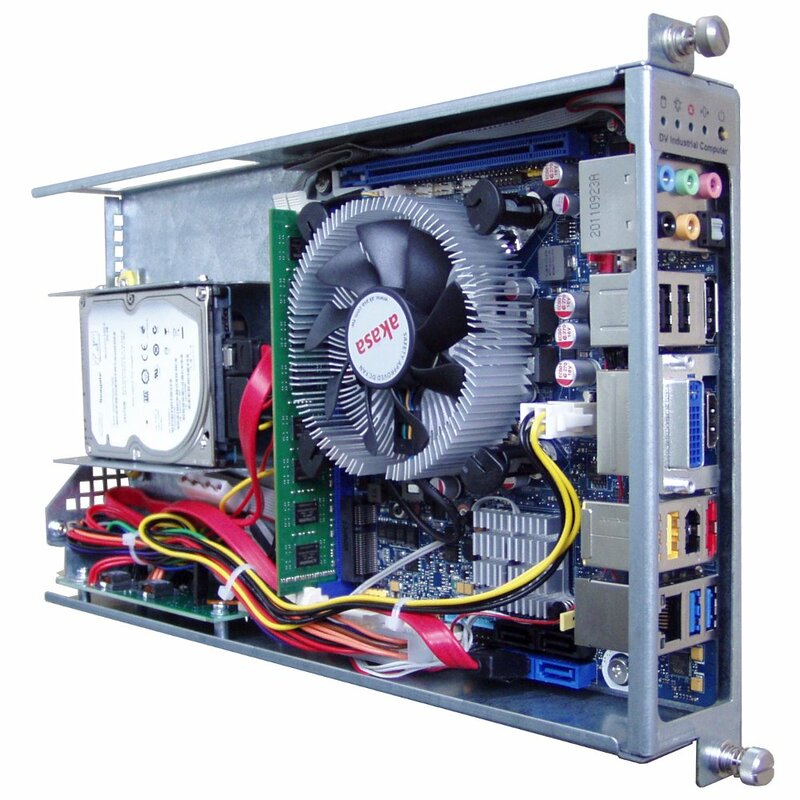 The AC/DC power supply contains of 3 Hot Swap units (Redundant 2+1). The unit is high efficient AC/DC converter with a wide range of input voltages (85-264V 50/60Hz AC) and 12V output. 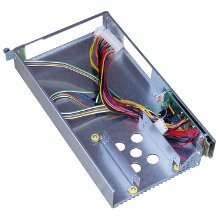 Passive backplane combines 3 outputs in one 12V powerfull rail with distribution over all the DC91 devices including DC/DC ATX converters in each of the 16 Trays. 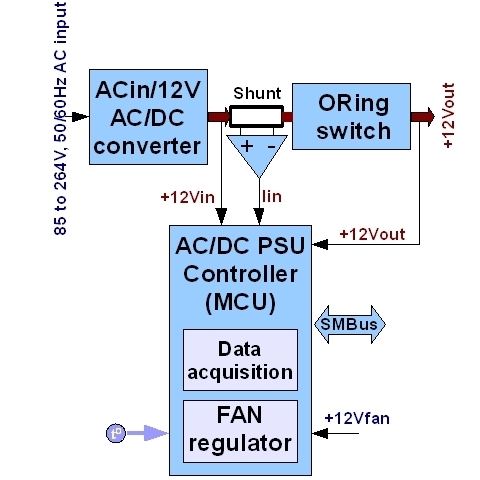 Each AC/DC converter unit has independent MCU - fan regulator with monitoring both cooling fans and temperature as well as output current and voltage. 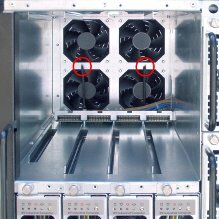 The subrack has 16 cooling fans of 80x25mm. 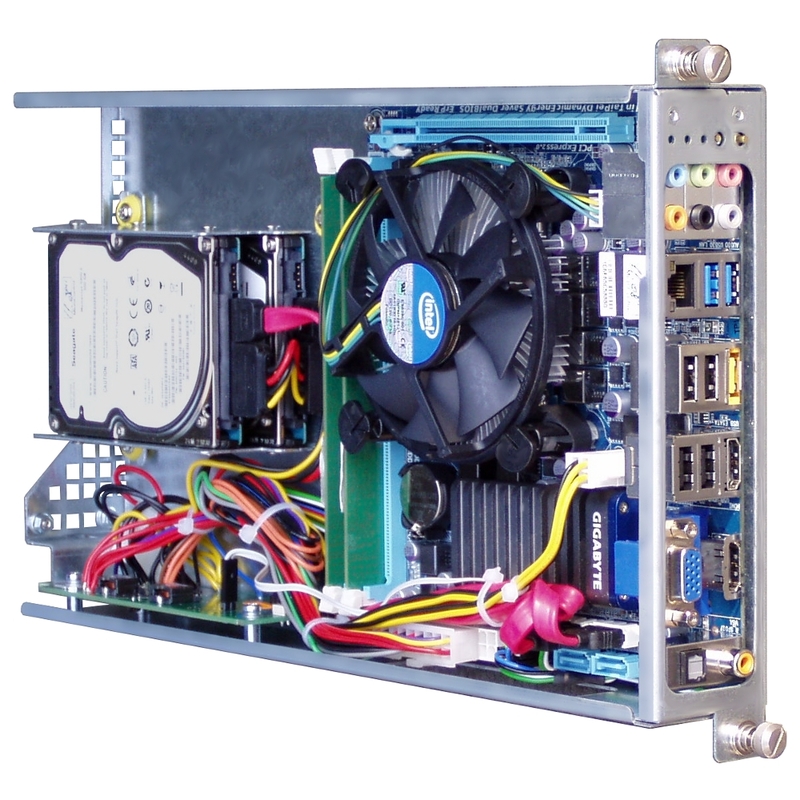 It is more than enough for Mini-ITX solutions. So, the DC91 fan regulator commonly reduces the fan speed down to 40%. This minimizes the system acoustic noise, prolongs fans life, diminishes power consumption. 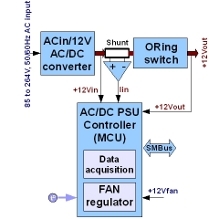 The DC91 assures early diagnostics of fan failures and increases reliability of hardware functioning due to the overall monitoring of cooling system and signalling the status. 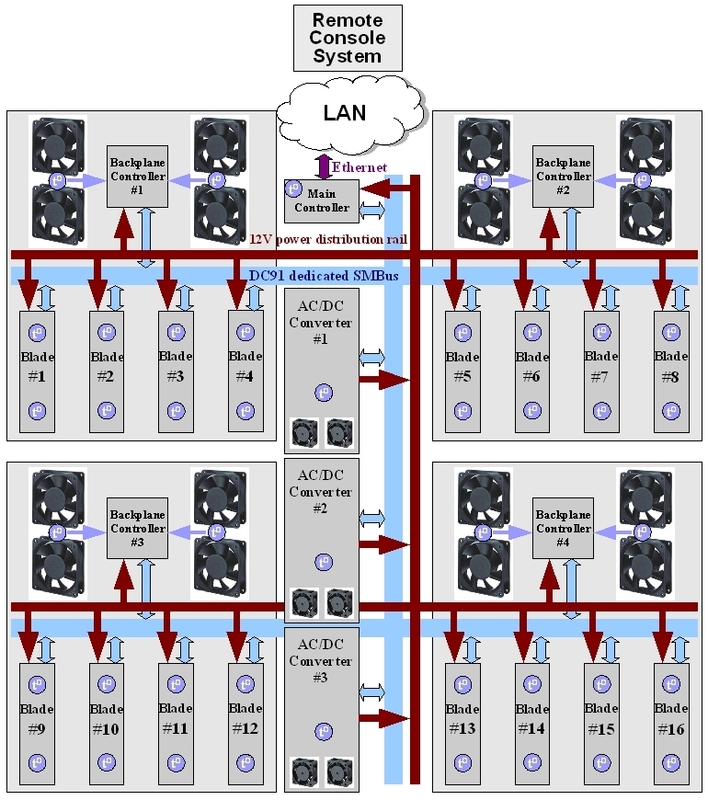 The DC91 uses pre-charted matrix to make linear fan speed regulation. Linear control varies the voltage applied to the fan to adjust its speed. Fan revolution varies depending on measured temperature. A number of thermistors (red circle marked) and MCUs (fan regulators) realize separated regulation of cooling fans for independent airflows.